Yesterday another book caught my eye while I was browsing in a Christian bookstore. Of course the fact that the book was on sale for half price was even better. I had given this book as a gift before but hadn 't read it. Nobody will ever be able to say that David Fisher lived too cautiously but, still, I wanted to get Luci Shaw's perspective on risky living. She is an especially insightful writer. There is a distinction, Shaw writes, between an impulse to takes risks and God actually leading us in a certain direction. Living cautiously isn’t always a bad thing; discovering God’s leading in our lives is key to understanding what risks we are to take. Shaw uses numerous biblical examples to support her position for seizing opportunity. And one of the most difficult emotions that prevent us from seizing opportunities is fear. Fear can paralyze us and cause us to miss out on what God can do with us and through us. 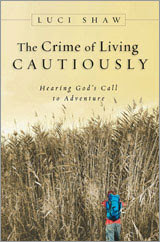 Shaw challenges the reader to critically examine our lives and realize where God might be leading. It’s not a call to abandon, but instead a call to adventure." "Risk must be firmly grounded in trust. And trust, by definition, always includes risk, the risk of the unknown or the dangerous known. Reaching the riverbank and the safety of solid ground felt a bit like reaching heaven after an earthly life of belief in the midst of often perilous and uncertain circumstances." —from chapter one of The Crime of Living Cautiously". Luci Shaw does not live cautiously—her life is an exuberant romp in the things of creation. Nor does she write cautiously—her poetry is a dive into the pool of spirited (Spirit?) language. This witness, a fusion of personal stories and revealing poems, welcomes us into the fullness into which Christ calls us." —Eugene Peterson, author of The Message.